When most people think about camping, they think about sleeping on the hard ground in a stuffy tent, but the seasoned outdoorsmen know that another way to get a comfortable night’s rest is in a hammock. 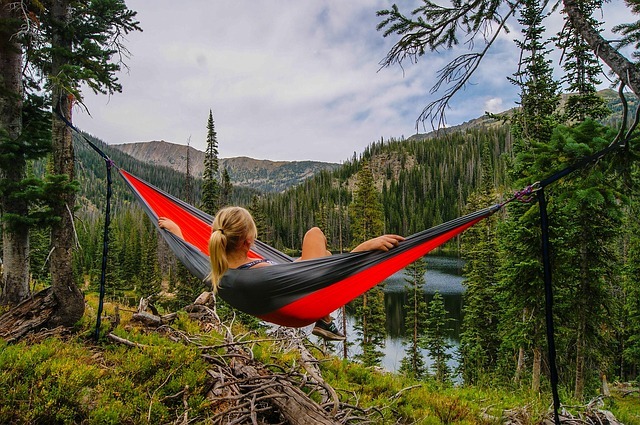 People who have been adventurous enough to try sleeping in a hammock rather than tent camping have found that they really like it. If you’re wondering about what it’s like to have noises lurking above you, you should know that you can set up a hammock tent or rain fly to keep you covered and protect you from the rain, and anything else that falls from the sky. Those who really enjoy tent camping don’t mind a little inconvenience of sleeping on an uncomfortable ground. They might even find it adventuresome to brave the mosquitoes to trek to the bathroom or the outhouse in the middle of the night. However, that's not all. They need to prepare the campsite by sweeping the area, clearing debris, and setting up their tent. Not to mention the extra work it takes to haul water, clean things up and prepare food, it’s all worth it because of the great fun you have exploring nature, swimming, fishing, hiking, biking, or whatever outdoor activity you enjoy. Even though they're not as convenient in set up, they can still be worth it if you want something on the smaller side like these best 2 person tents. Hammock lovers say that the sway of the hammock makes them fall asleep faster and that they fall into a deeper sleep. Having solid rest helps them focus and concentrate better during the day and lets them enjoy nature all the more. Hammock dwellers say that the hammock is comfortable for their backs. It takes the right equipment and a little experience to hang a hammock between trees to get just the right sag. Once you master that, a hammock is a pretty comfortable place to sleep, particularly if you get one with a mosquito net. This is an extra large rain fly that protects your gear from rain and protects you from the sun. It is made with a quality rip stop nylon waterproof material. It comes with 100” of cord and has 6 attachment points so that you can secure the fly to the ground. It has line lock buckles to help you pull the rain fly taut. Ultimate Survival Technologies is a company that is highly regarded for field testing survival gear, so you know that this rain fly is water tight. It’s ultra-lightweight and compact. It can be used to cover a tent, a hammock, or as an all-weather tarp. It’s bright orange in color and one size fits all, and it’s big enough for two. This rain fly is a high quality, waterproof cover made of nylon. It has stitched and taped seams for long-lasting wear. It is very easy to set up and take down and it comes with a stuff sack to tuck it away for storage. It has 6 attachment points and a rectangular-shape that provides effective coverage for double hammocks. This rain fly protects your hammock from rain and sun. It’s large enough to cover you, your hammock, and all of your gear too. It comes with high visibility guy-lines so you won’t trip over them. The corners are reinforced for greater durability. It has a tensioner to wind it taut and the metal stakes fasten it securely to the ground. This is an oversized rain fly that does double-duty to tie over your cooking area during the day and then re-tie it over your double hammock for safe sleeping. It’s 10’ x 12” in size and the PU-coated polyester tarp has 6 tie-out points for easy positioning. This is one of the largest rain fly shelters available. It will cover up to 4 people in a tent, so there’s plenty of coverage for a double hammock. It measures 7’ x 7’. It’s made of a waterproof material that is ultralight. It has 6 multiple light-weight webbing hoops and the corners and center guy-line points are reinforced. It’s great to lay in a hammock during the day and gaze up into the sky. At night, you want a little more protection. Sleeping in a hammock gets you up off the cold, hard ground, but you’ll want a cover over you to protect you from mosquitoes. You’ll also want protection from leaves and other things falling on top of you. An extra-large-sized rain fly keeps you dry and protected from the elements. Place a blanket underneath you to prevent a draft from below. Sleep at an angle in the hammock for the most comfortable position.